Ground-feeding, striking blackbird. 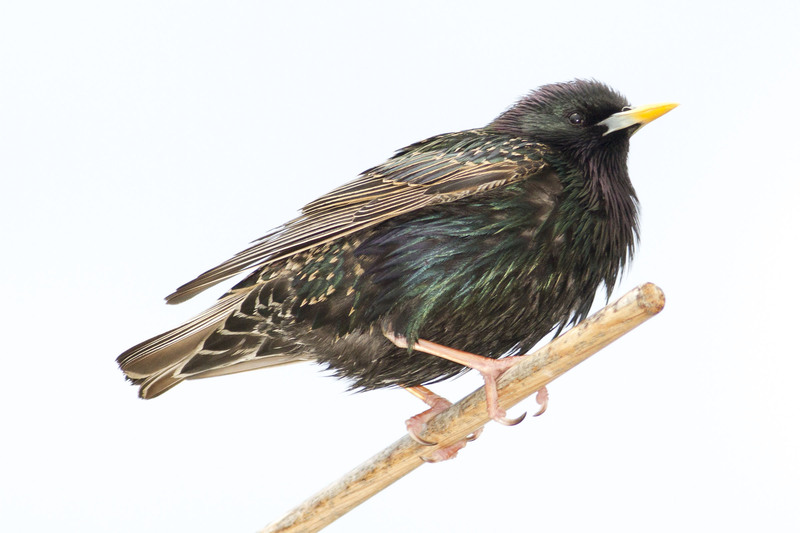 100 European birds released in Central Park, NY in 1890s; now common throughout most of North America in towns, agricultural areas and other human developments. Shiny black with long yellow bill in summer, white-spotted with darker bill in winter; juveniles brown; short-tailed; triangular wings in flight. Vocal mimic, with individuals imitating up to twenty species. Often in flocks probing lawns or soil for insects. Varied diet also includes berries, seeds and even trash. Cavity nester, often using human structures, including nest boxes. May aggressively drive out other species from nest holes for their own use. Lifespan up to 15 years. North America population ~ 60 million and declining.